Join Us For The Staples #BTSReady Twitter Party! I’m making a list and checking it twice. No, I haven’t started Christmas shopping yet but I am getting ready for the back to school season! My son (the little social butterfly) has been wearing his backpack for weeks asking if he can go to school. We’re still a year away from kindergarten but I’ll be setting up our own little school at home this fall. This year I’ll be doing my back-to-school shopping both as a teacher and for a student. When shopping for school supplies, I want to make sure that I’m getting the best deals but I don’t want to hop from store to store looking for the best prices. Staples is making it easy for everyone this year by doing the homework for us! They’ve done their research on the latest trends, what products students need, how many products they need to stock for the season and calculating the best prices. Did you know that Staples has a 100% price match guarantee? They want to simplify the back-to-school shopping process for you so you can spend more time at the beach enjoying the final days of summer holidays. Did you know that you can earn AIR MILES on your purchases both in-store an online? After a few months of homework, packing lunches, and driving your kids to activities, you’re sure to start dreaming of a winter holiday. Start earning those AIR MILES now and use them towards your next family getaway. Watch for the special Bonus AIR MILES offers as well! Head over to your local Staples or shop online and find out why Staples is the top retail destination for back-to-school essentials! 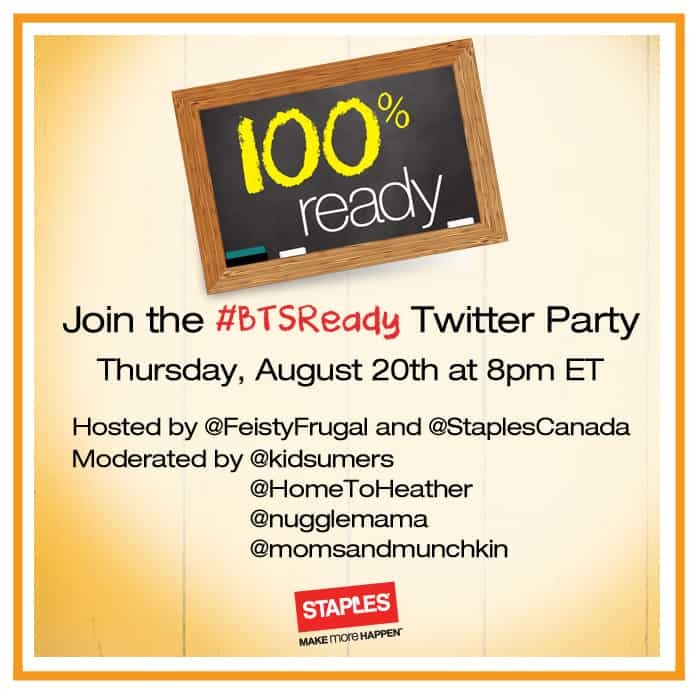 Join us on Thursday, August 20th at 8pm EDT for the Staples #BTSReady Twitter Party! We’ll have some fabulous prizes from Staples to help your students get ready for the back-to-school season. We look forward to seeing you there! Be sure to RSVP below to be eligible to win prizes at the party. Disclosure: I was compensate for this post; however, all opinions expressed here are my own.